Simply put, remote desktops allow a user to have access to a computer from another computer either through a network or the internet. For example, you could be sitting at home and be remotely connected to your computer at work with access to all of the applications, files and resources of that computer just as if you were using them at work. RDesktop is an open source Remote Desktop Protocol (RDP) client available for the Amiga and other platforms that allows the user to remotely connect to any computer supporting the RDP protocol. The main homepage for RDesktop is http://www.rdesktop.org. This article looks at how to configure RDesktop on an Amiga to remotely access a PC running Windows XP Professional within a local network and some of the potential problems you may run into. All you require for using RDesktop is an Amiga running AmigaOS 3.x or AmigaOS 4.x with AmiSSL installed and a PC running either Windows NT4 Terminal Server, Windows 2000/2003 Terminal Services or Windows XP Professional which you have access to either through a network or the internet. The Amiga version of RDesktop is freely available from http://www.hd-zone.com/remote-desktop/. AmiSSL can be freely downloaded from http://www.heightanxiety.com/AmiSSL/. Under the Remote Desktop section make sure that Allow users to connect remotely to this computer has been ticked (highlighted in the above image). For security reasons it is a requirement that the user account you are intending to log in with has a password. Without a password you will not be able to remotely connect to the computer. If you need to add a password then you can do this in theUser Accounts options in the Control Panel. Another problem that can arise is if your firewall is blocking the communication between the two computers. If this happens then you will need to configure your firewall so that communication is not blocked. Refer to your firewall documentation on how to do this. If you require any further information on setting up a remote desktop in Windows then I suggest that you have a look at the help topics supplied with Windows or refer to http://windows.microsoft.com/en-us/windows/remote-desktop-connection-faq. If you are using the AmigaOS 4 version of RDesktop then this also comes with the RDesktopGUI utility which makes configuration a breeze. If you are familiar with the remote desktop configuration utility in Windows XP then you will feel right at home with this. Users of AmigaOS 3.x or MorphOS can also get RDesktopMUI which is available from http://amigazeux.net/rdmui/. 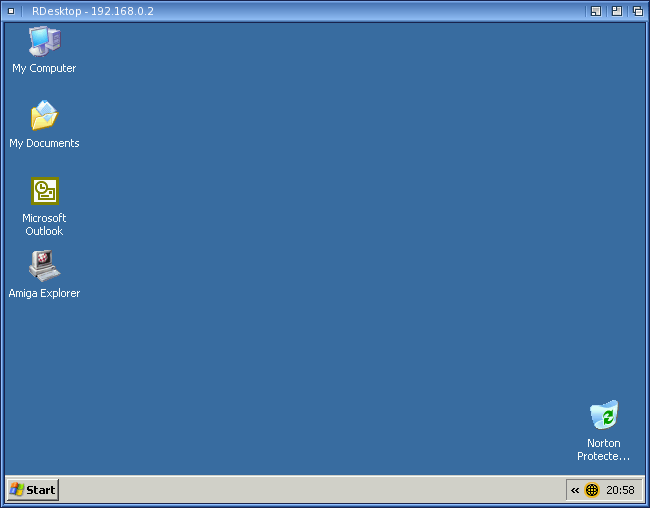 The operation of RDesktopMUI is virtually identical to RDesktopGUI. 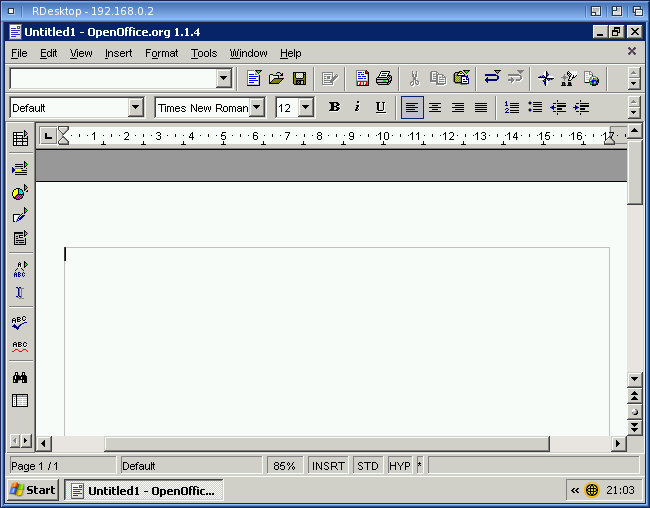 Here you would type in the network address of the computer that you want to connect to either in octal form like that shown in the image above or by using something like www.mycomputer.com. In this case the address 192.168.0.2 is the address of the one of the PCs in my local area network. Clicking on the Options button will provide you with more options to configure RDesktop. All of the options are explained in the RDesktop documentation so only the main ones will be mentioned here. The Logon settings section allows you to enter the address of the computer the same as before and also additional details such as the user name, password and the domain so that RDesktop can automatically log in without you having to input these details at the Windows logon screen. You can also choose to save the password so that you do not have to type it in every time you logon. The Connection settings simply lets you save your current settings or open a previously saved connection. It is worth noting here that you can have RDesktop automatically load a saved connection by adding DEFAULT = filename to the icon tooltypes of RDesktopGUI where filename is the name of your saved connection. Remote desktop size allows you to set the size of the window that your remote desktop will be displayed in or you can select full screen. Colours sets the number of colours that will be displayed on the remote desktop, although some older versions of Windows do not support anything higher than 8bit colour in the remote desktop. The Experience section allows you to obtain the best performance by selecting the speed of your connection. The faster the connection, the more information will be transmitted allowing for more features to be present on your remote desktop. Should you find that the remote desktop is a bit slow or sluggish then try selecting a slower connection speed. Assuming everything has gone smoothly so far, clicking on Connect should present you with the Windows login window. Here you would type in your user name and password if RDesktop has not already been configured to automatically log you in. Once logged in the Windows desktop will be displayed and you can start using it as if you were actually using the PC you are now remotely connected to. 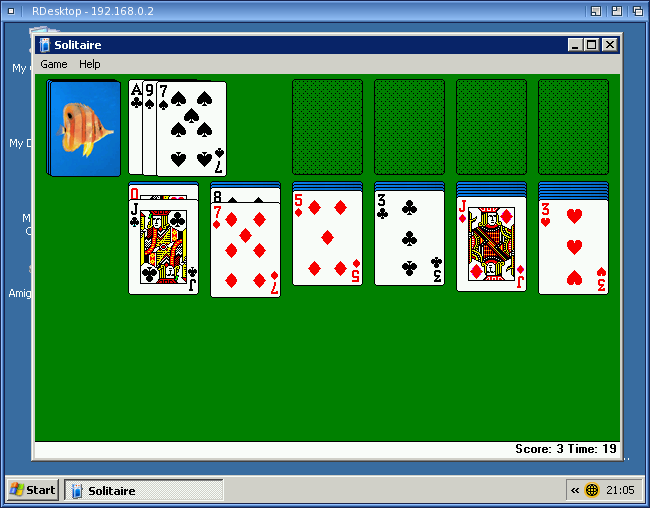 …or if you feel you have been working too hard you can even play a game of Solitaire! My only gripe with the remote desktop is that you can only have one user logged onto the PC at a time, although this more a limitation of Windows XP Professional due to its licensing restrictions rather than RDesktop. Attempting to remotely log on while someone else is logged onto the PC causes them to be logged off which can be annoying. If you need the capacity for more users to be logged on you would require one of the server versions of Windows installed on the PC being remotely connected to. Overall I must admit that I am very impressed with how well RDesktop works and how easy it is to set up and use. Due to space restrictions I have my Amiga and PC connected to the same monitor and I find it a godsend being able to work using both of them simultaneously on the same screen rather than continuously switching between them.